There are a number of ways to take down notes on a Mac. You can use Stickies on your desktop, Dashboard’s Stickies widget, TextEdit, and other 3rd party applications. The best method, however, is Sidenote’s smooth now you see it, now you don’t functionality. 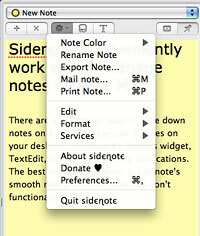 Sidenote is a lightweight freeware application developed by Pierre Chatel that organizes your notes in a resizable, scrollable window and attaches itself to the side of your Mac’s screen (you choose which side — left or right). When rolled over with a mouse or triggered with a hotkey, the virtual drawer opens to reveal your notes. To make it disappear, simply roll your mouse away from the Sidenote window. It’s simple, easy, and incredibly intuitive to work with. This is in stark contrast to Stickies, which can grow cumbersome when you’ve got a bunch of text to work with. To make it even more convenient, there is an option to keep the drawer stuck open for when you need to move your mouse around and keep the notes visible at the same time. The beauty of Sidenote is not just its ability to appear and disappear with the flick of a mouse, but also its versatility and expansiveness. 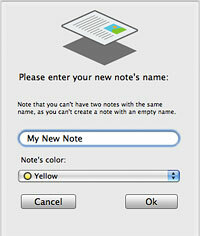 A variety of settings are available to customize your experience and make notes more functional for your needs. For example, the ability to format text is integrated into the program and items other than plain text such as images, text clippings, and PDFs can be dropped into the Sidenote window. In addition, you can manage multiple documents in the same drawer and change their background colors (if you’re into color-coding) for easy organization. When you’re ready to bring a note out of Sidenote, you can even export, email, or print it as you see fit. Best of all, Sidenote automatically saves your documents as you work with them so there’s no need to worry about losing information due to forgetfulness. If you’re always jotting something down on your Mac, give Sidenote a shot. I’ve been using it for years to manage my notes and am thrilled with how much time it saves me on a daily basis. Check out Pierre Chatel’s home page to download Sidenote for free.